WELCOME TO THE GLASS ROSE! THE GLASS ROSE (official name is La Rosa de Cristal) is a professional stained glass studio located in the Colonial village of La Antigua Guatemala, Guatemala. I make stained glass projects ranging from small "sun catchers" and three dimensional objects to lamps, windows, and door panels. Most pieces are made using the copper foil (Tiffany) technique. Large panels, windows and door panels are made using the "leaded glass" technique. I have been working with stained glass for over 30 years and have done work in the United States as well as in Guatemala. You can view a few sample pieces on the "Gallery" page. I will be adding images as work is completed. At present, THE GLASS ROSE is a one man (me) operation. I am now training an assistant who will be helping me in various stages of fabricating projects. On the "Process" page you can see the various stages of work that have to be done to make a stained glass project so you can understand why the projects take so much time and cost what they do. I would welcome the opportunity to work with you to create a special piece that you will enjoy displaying in your home or business. I use glass from Spectrum Glass almost exclusively in my projects. The Glass Rose is an approved Spectrum Glass Company "ProStudio". Click on logo for listing. Click "Professional Studios" from the drop down menu under "Sources of Supplies", Choose "Guatemala" in International, "La Antigua" will show as city, click on "Continue". 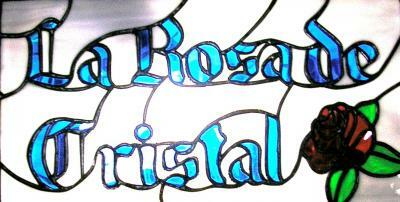 Listing will show as La Rosa de Cristal. My stained glass sign in interior door of the shop. Click on The Art Glass Factory Forum logo below to visit and, if you wish, to join the fastest growing glass forum on the net. You will be warmly welcomed. Click to visit Darryl's site...some interesting patterns...some free ones as well. To contact me by e-mail use the contact button on the left of this page. I am generally in the shop between the hours of 9:00 am and 6:00pm Monday - Saturday. You can always call me for an appointment or to see if I am available.